Click/Tap a thumbnail image to see its larger image with informational details. Most thumbnails have three clickable/tapable areas - flower, plant, and foliage. USES: The following is a quote from Wikipedia about this plant: "Various Native American peoples had many different uses for this plant; all parts of it were used by one nation or another. Perhaps the most common use was to make poultices to be applied to bruises or sores. In addition, the young stalks and leaf stems - before the plant reaches maturity - were widely used for food with the outer skin peeled off giving a sweetish flavor. The dried stems were also used as drinking straws for the old or infirm, and to make flutes for children. A yellow dye can be made from the roots, and an infusion of the flowers can be rubbed on the body to repel flies and mosquitoes". It is also noted that the plant can ruin the milk of cows that eat it. 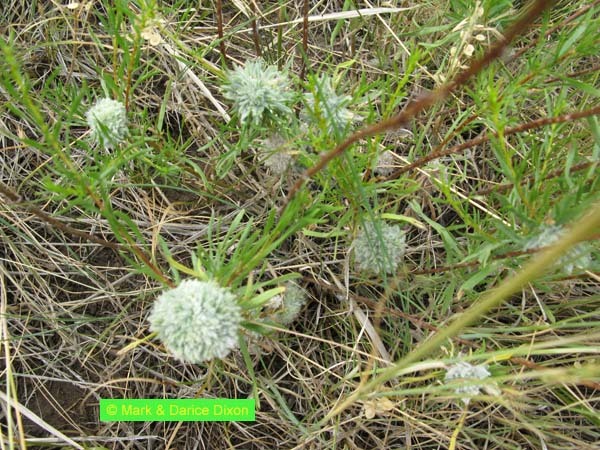 The plants are listed as an endangered species in the state of Kentucky. Plant location: Photographed on July 7, 2007 off the side of the road headed toward Greenwater Washington. Bloom season: February through September. This rose look-a-like is one of 237 species in the genus and is a perennial vine/shrub. The leaves fall when the plant is fully mature for the season. 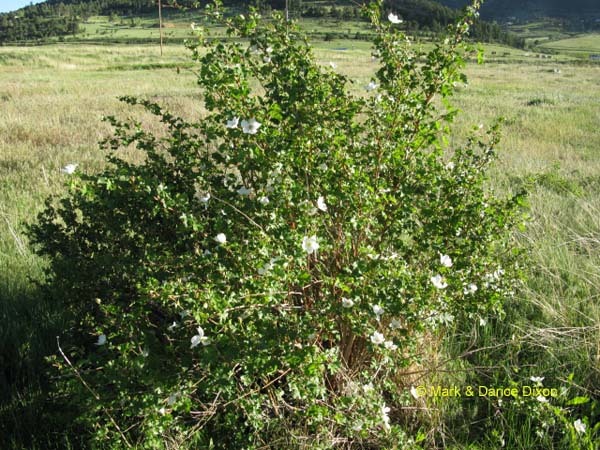 USES: Per the website Plants For a Future, the berries of this plant are edible: Fruit - raw or cooked. The fruit is not highly valued being somewhat dry with many seeds to little fruit. But the flavour is reported to be delicious. A purple to dull blue dye is obtained from the fruit. Plant location: Seen in the Rocky Mountain foothills in Colorado state at Hwy 72 and Plainview Road. The date was June 6, 2008. This variety is found only Colorado, New Mexico, Oklahoma, and Wyoming. Bloom season: June and July. Note: this early and the berries were already forming. Plant location: Photographed along Colorado 9, closest town - Silverthorne Colorado - GPS coordinates: N39?49.177 W106?12.365 - Elevation: 8049'. The date was July 5, 2011. Bloom season: May through September. 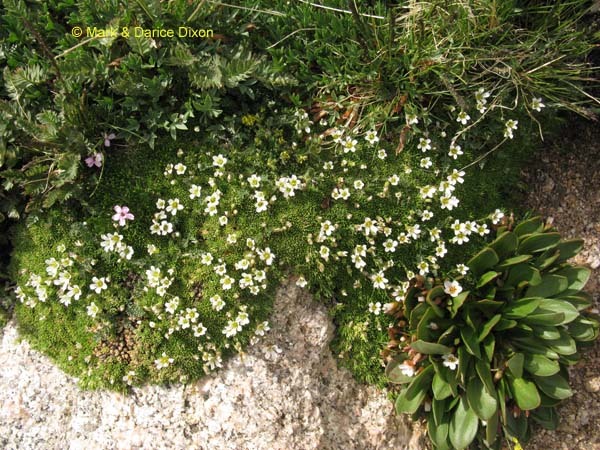 This is a low plant forming mats or clumps and bearing small thimble-shaped flowers with curving white petals. It is one of 38 species in the genus. 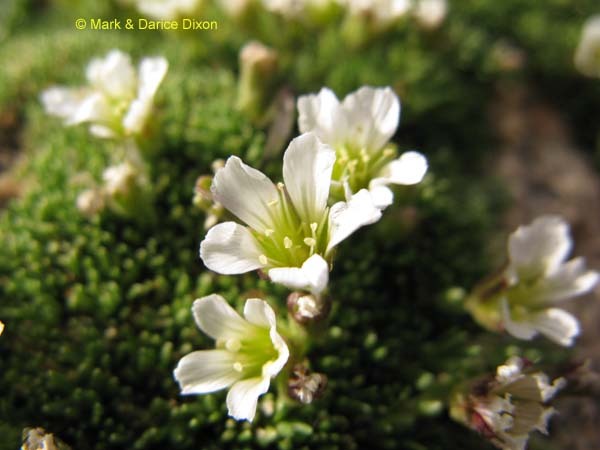 The plants grow in elevations up to 13,123 feet. Per WIKIPEDIA: It is native to the mountains of western North America from the High Sierra of California to the Colorado Rockies north to Alaska. Its range may extend into far eastern Russia. Plant location: Photographed on Mt Evans Colorado, all the way up top, on July 20, 2008. Found in the following United States: AK, AZ, CA, CO, ID, MT, NM, NV, OR, UT, WA, WY. 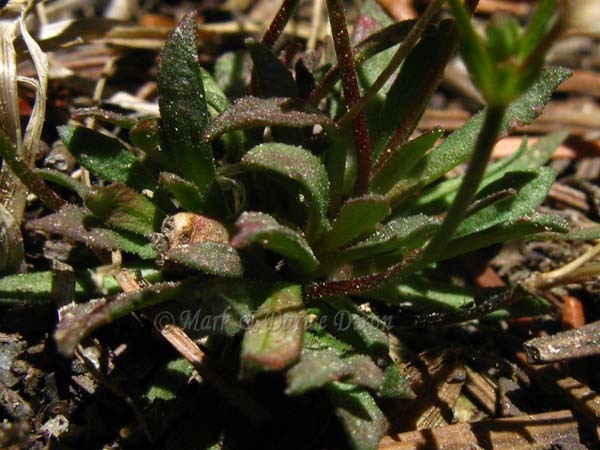 Habitats include dwarf willow communities, fell-fields, snow beds in subalpine and alpine areas. Bloom season: June to September commonly. Was in the Ranunculaceae (Buttercup) family until reclassified based on the type of fruit that the plants produce. These plants LOVE the water. We saw for ourselves just how much. At a creek crossing along the trail there were many of these fresh white flowers lining the banks. A new flower was a good reason for halting to take pictures. A close look for the best specimens and lighting caused us to notice a sight never before seen. There were two wide open blooms close to the bank COMPLETELY submerged in water, looking perfectly happy and lovely. We of course took pictures of this, however, the water was so clear that it was not apparent that the flowers WERE under water. 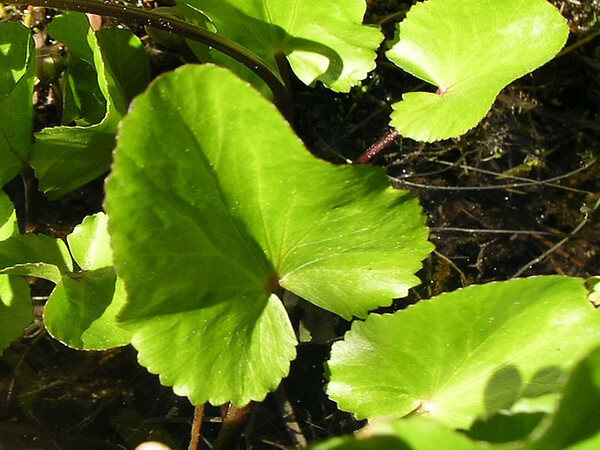 The genus Caltha is very small, only 10 species. 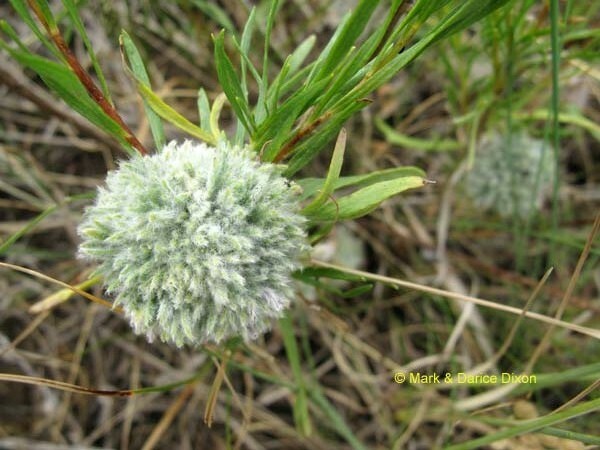 The elevation range of the plant is 3000 to 11,000 feet! There are actually two variants of Marsh marigolds. It is a matter of botanical debate if they are subspecies or should be named independently. Our interesting specimen has qualities of BOTH. The petals are rounded like the subspecies leptosepala, with the foliage more like that of the subspecies howellii. See what YOU think. 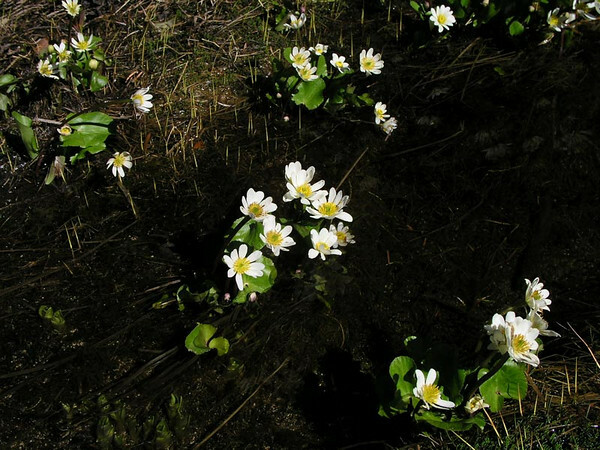 See the species of Caltha that we photographed in Colorado, here. Plant location: Sighted on July 4, 2007 hiking Bench/Snow Lake on Mt Rainier (Washington state). Bloom season: May through August. 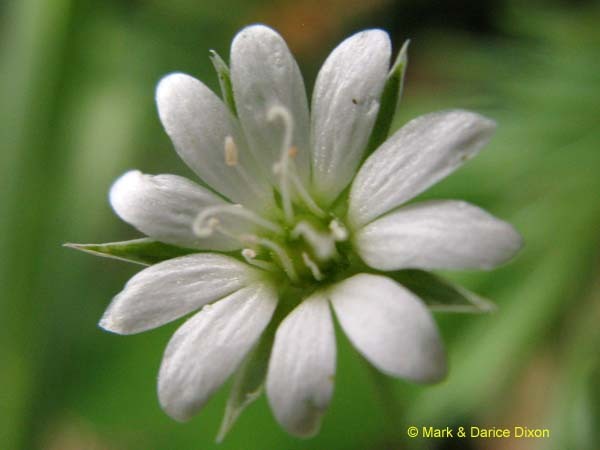 These very pretty flowers are one of 90-120 species in the genus Stellaria, part of the stichwort or chickweed group.o Some species are edible but there are no specific records of that for this species. Stellaria's are favorite foods of seed eating birds such as finches. They are perennial herbs. Plant location: These were in the Rocky Mountain National Park, on July 17, 2008. 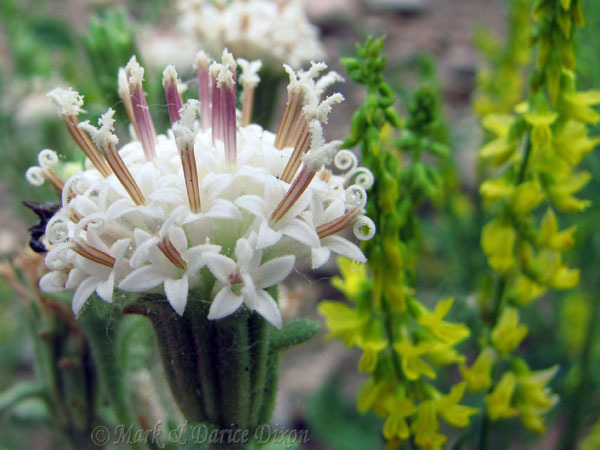 Found in the following United States: AK , AZ , CA , CO , ID , MI , MN , MT , NV , NM , NY , ND , OR , SD , UT , WA , WI , WY Bloom season: April. This plant puts on a marvelous display of pure white brightness as it expands it's horizons through the season. 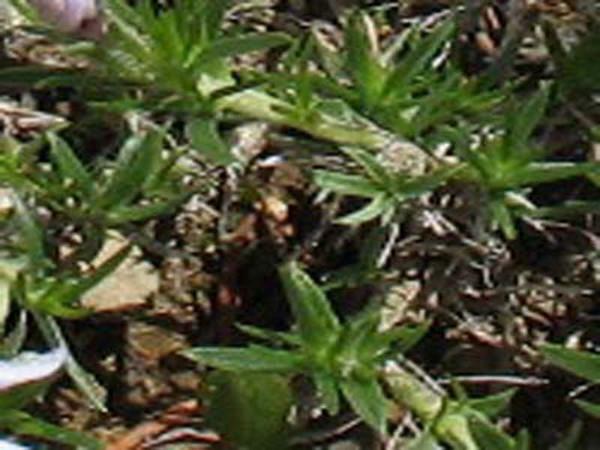 It is a ground covering type of growth. 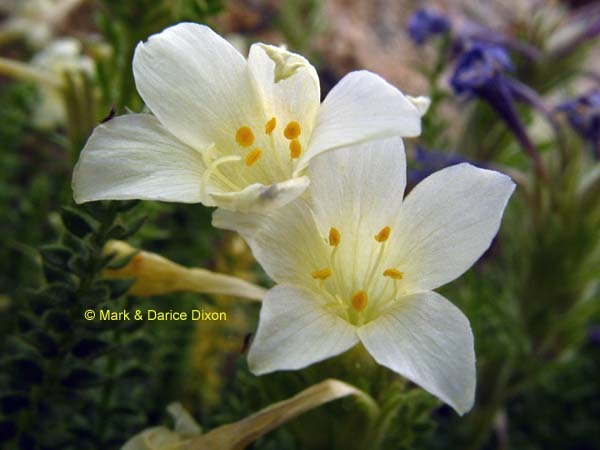 It is considered an alpine plant, although it can be found as low as 3500 feet. 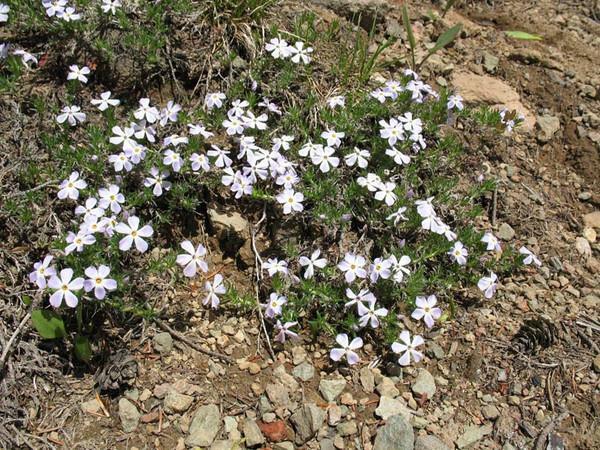 The Mt Rainier area has recorded phlox as high as 12,000 feet! 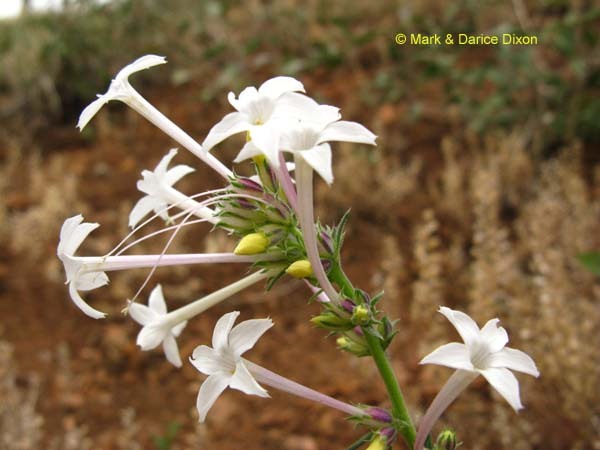 The genus Phlox is fairly small with only approximately 67 members. Most of these are native to North America, but some are from northeastern Asia. 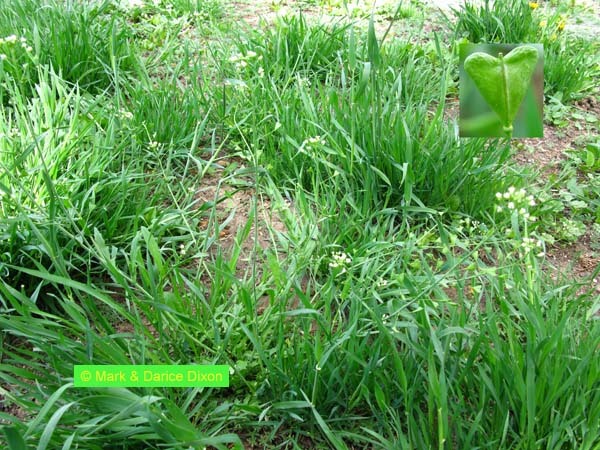 The flowers are supposedly a popular food source of deer, groundhogs, and rabbits. Some varieties of Phlox have made their way into the common garden and are appreciated for their tendency to attract butterflies. 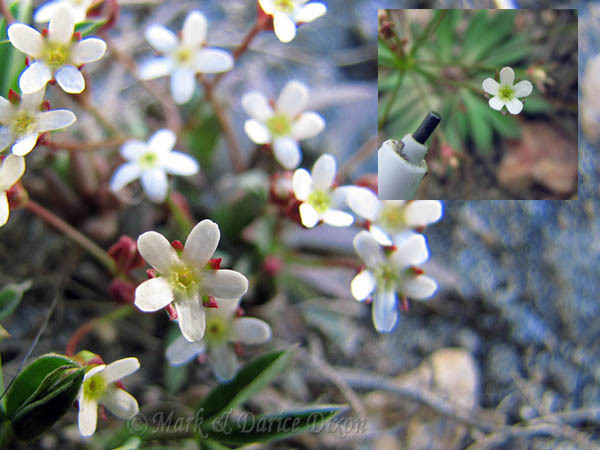 Plant location: Hiking Esmerelda Basin, in the Cle Elum Washington area. Mid June, 2007, was the sighting of this particular specimen. 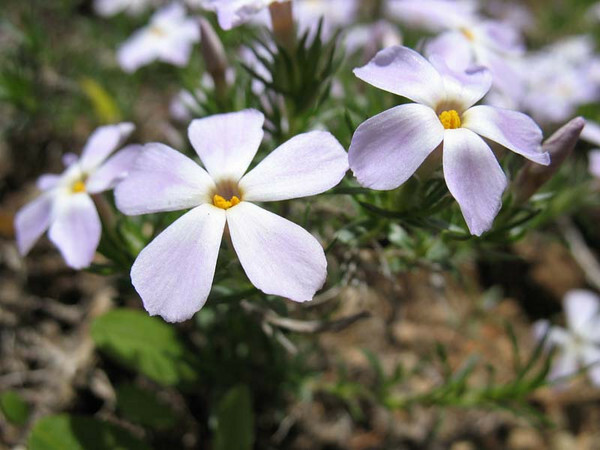 We have seen good numbers of spreading phlox in many areas of Washington and Oregon, including Mt Rainier, Mt Adams, and Dog Mountain. Bloom season: June through August, but it is not surprising to see it still going strong in September. 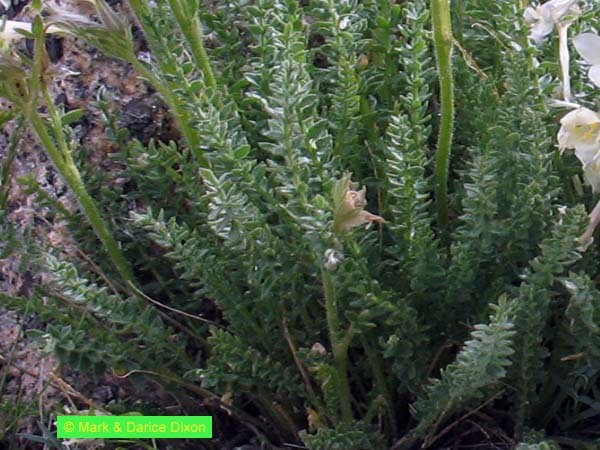 Weber notes that this plant has usually been included in the genus Lepidium. He does not agree based on fundamental differences between it and other members of Lepidium. Plant location: Hwy 72 and Plainview Road, Colorado, we can't remember the name of the Open Space. June 6, 2008. Bloom season: May through July. This especially delicate looking flower is a KILLER!!! The red berries that this plant bears has been reported to have fatally poisoned young children in Europe. But there is more to learn about this plant; Actaea is recorded as a food plant for the larva of the Dot Moth. Plant location: Larch Mountain, Columbia Gorge area Oregon state - early July 2007. Bloom season: May through July. This example of the species shows the plant in it's later stage of the season. It is extensively used in cooking. 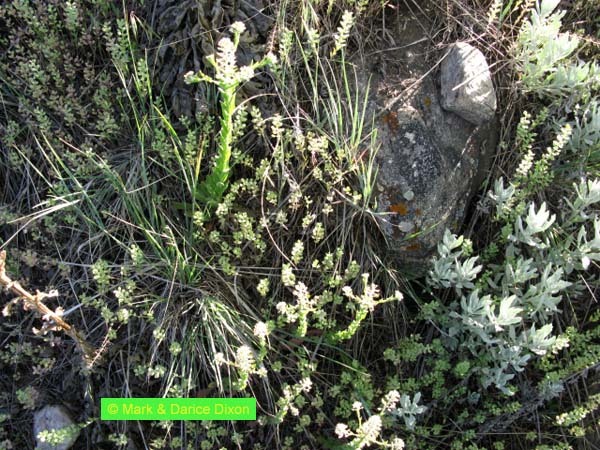 There are a total of about 68 species in the genus Artemisia. This is found widely across the United States. 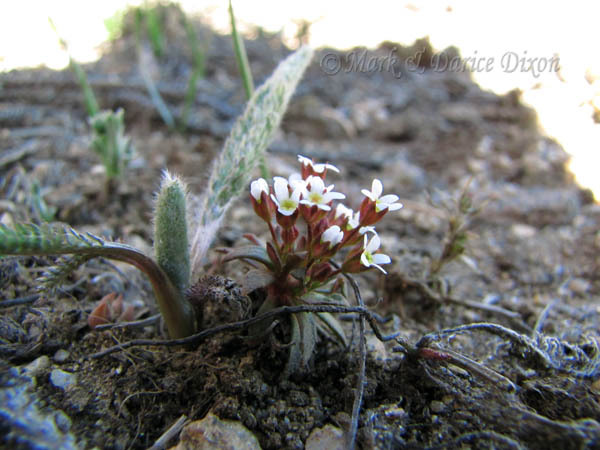 It grows from approximately 1650' up to about 9850' in elevation. USES: There are a HUGE number of records of uses of tarragon by Native Americans from the website Native American Ethnobotany. Some of the more intresting ones are: Keres, Western (Insecticide) Plant used in the bed as a bed bug repellent. Costanoan Drug Decoction of roots used for dysentery. Decoction of roots used for infants with colic. Decoction of roots used for urinary problems. Crow Drug (Eye Medicine) Infusion of stems and leaves used as an eyewash for snowblindness. 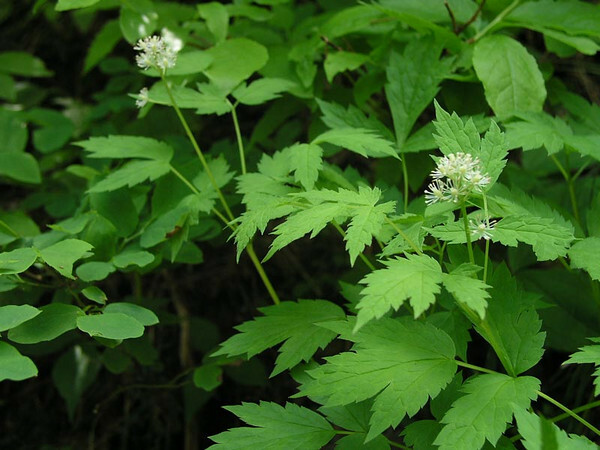 Okanagan-Colville Drug (Analgesic) Poultice of mashed, dampened leaves applied to the forehead for headaches. 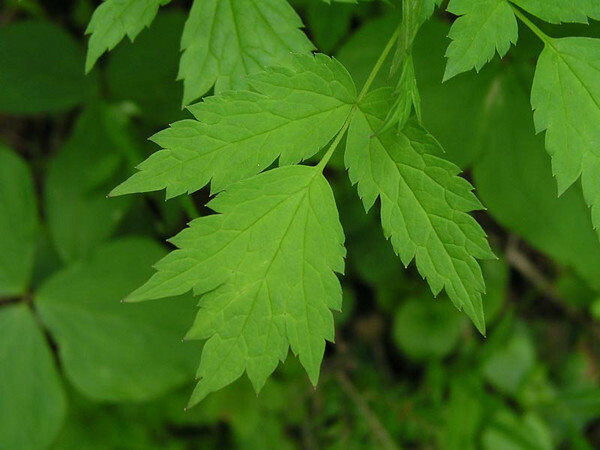 Leaves used in diapers or used as a diaper for diaper rash and skin rawness. Leaves used as sanitary napkins. Shuswap Drug (Gynecological Aid) Plant used by women at childbirth. Plant burned to keep away mosquitos. Thompson Drug (Veterinary Aid) Decoction of plant used after injuries to wash horses' legs every day until healed. 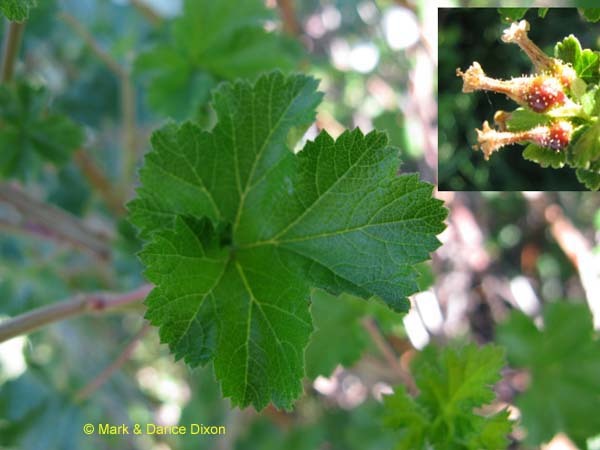 Okanagan-Colville (Insecticide) Branches with leaves used as an insect repellent & stopped flies from laying eggs in stored salmon. Omaha Drug (Love Medicine) Chewed root put on clothes as a love charm. Hopi Food Leaves boiled or roasted between hot, flat stones and eaten. Leaves baked between hot stones, dipped in salted water and eaten. Shoshoni Food (Spice) Steeped seeds added to dishes for flavoring. From Plants For a Future is this: The leaves contain about 0.3% essential oil, about 70% of which is methyl chivacol. This is used as a food flavouring, in detergents and also medicinally. 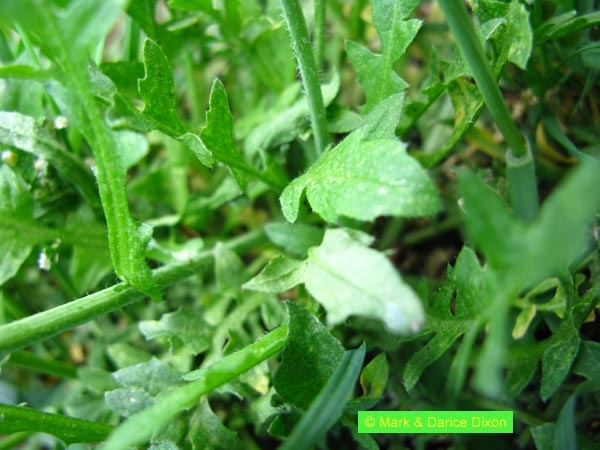 Both the growing and the dried plant repels insects. 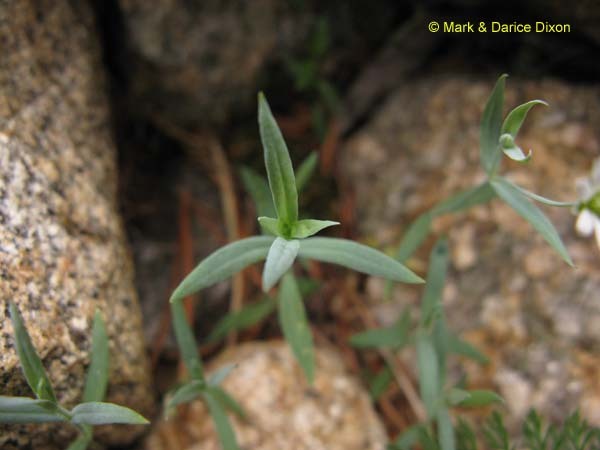 FunFacts: The scent of tarragon is disliked by many garden pests, making it useful for intercropping as a companion plant, to protect its gardenmates. 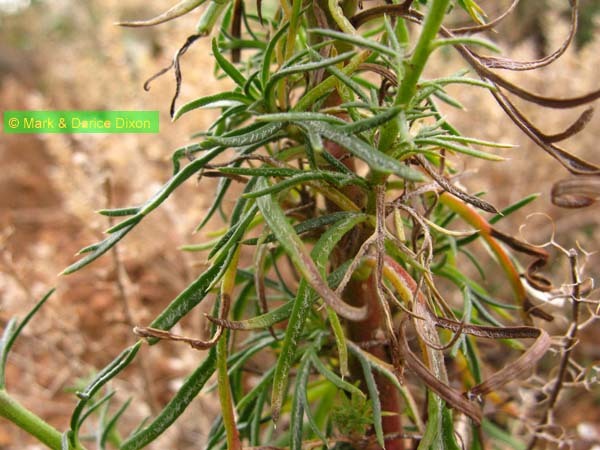 It is also reputed to be a nurse plant, enhancing growth and flavor of companion crops. Tarragon's name is derived from the French esdragon, meaning "little dragon." The dragonlike roots may strangle the plant if it is not divided often. 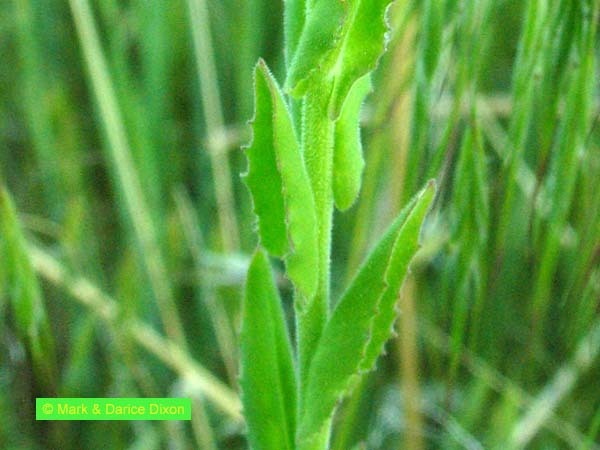 In medicinal lore and legend, any plant with a serpentine root system is given credit for treating snakebite, and tarragon is no exception. The Roman scholar Pliny said it could prevent fatigue and pilgrims of the Middle Ages put sprigs of it in their shoes before beginning long trips on foot. Plant location: Hwy 72 and Plainview Road, Colorado. July 11, 2008. Bloom season: July through November. 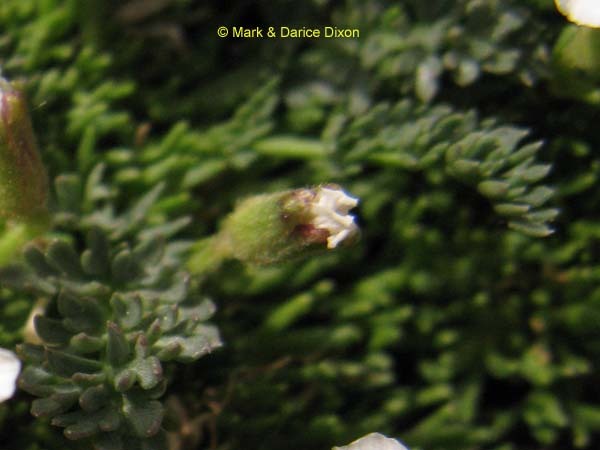 These TINY plants are so easily overlooked, we almost did. 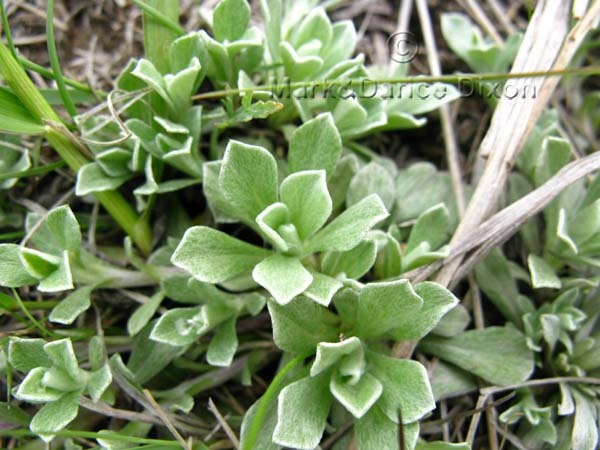 They are natives of North America, Asia, and Europe and are both annual and perennial herbs. Graceful and delicate, the height of these plants can vary based on conditions. The taller specimens could easily be substituted for Babies Breath in flower arrangements. They can reach as much as 8 inches tall. 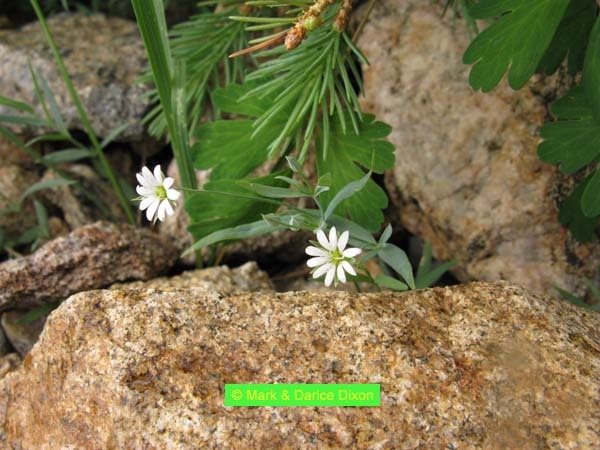 Worldwide there are about 100 species in this genus with Weber naming only 4 species as present in the Eastern Slope area of Colorado. There are five subspecies of septentrionalis: glandulosa, puberulenta, septentrionalis, subulifera, and subumbellata. 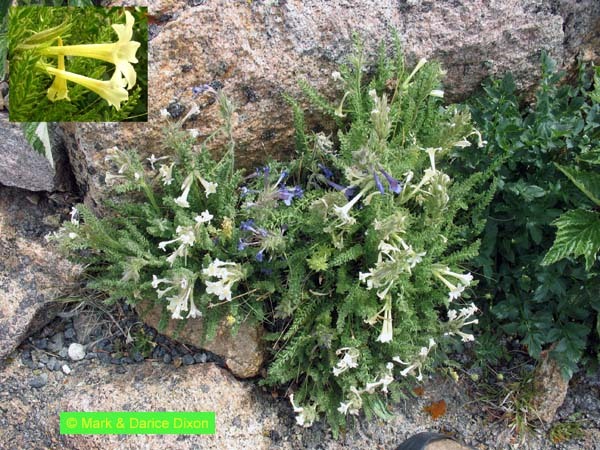 USES: From the always facsinating website Native American Ethnobotany are the following records of uses of this species by Native Americans: Navajo, Ramah - Cold infusion taken for internal pain. Plant used as "life medicine." Compound decoction of plant taken before sweatbath for venereal disease. Plant used as a lotion to give protection from witches. 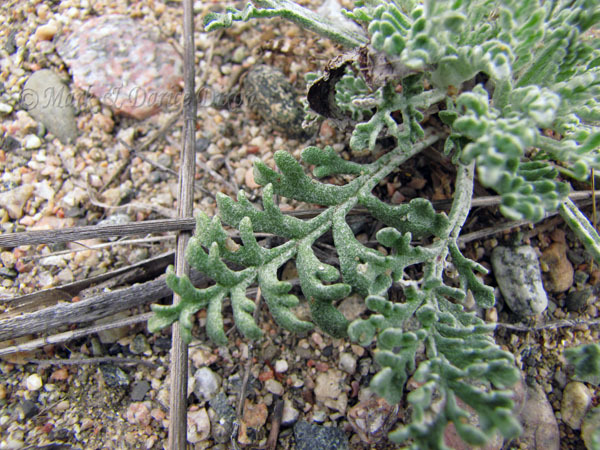 Navajo, Kayenta - Plant used for pain from witches' arrows. Plant location: Seen in the Mt. Goliath Nature area, M. Walter Pesman Trail, on Mr Evans in Colorado. June 23, 2010. 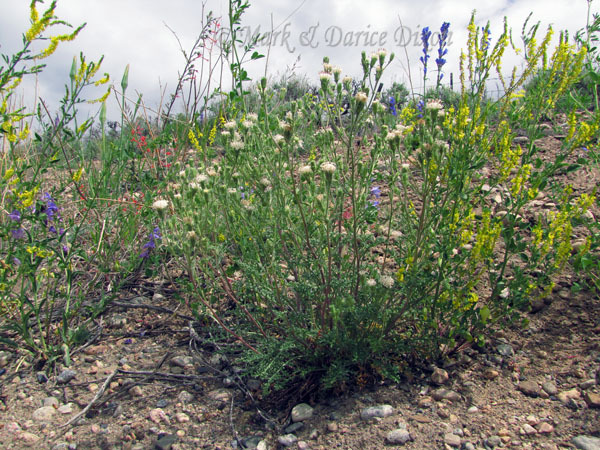 GPS coordinates: N39?38.491 W105?35.660 - Elevation: 11,661' These sweet LITTLE plants are found in the following United States: AK, AZ, CA, CO, ID, MN, MT, ND, NM, NV, OR, SD, TX, UT, WA, WY. And throughout all of Canada. Our sighting happened to be quite above it all at over 11,000 feet but the plants can be found in habitats from foothills to alpine. 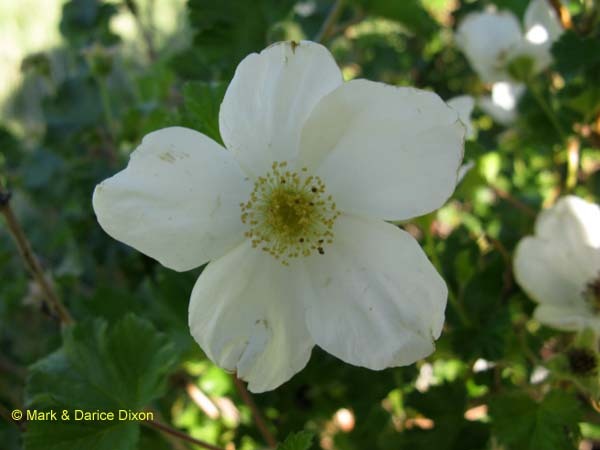 Bloom season: May through August in both forested and open areas. 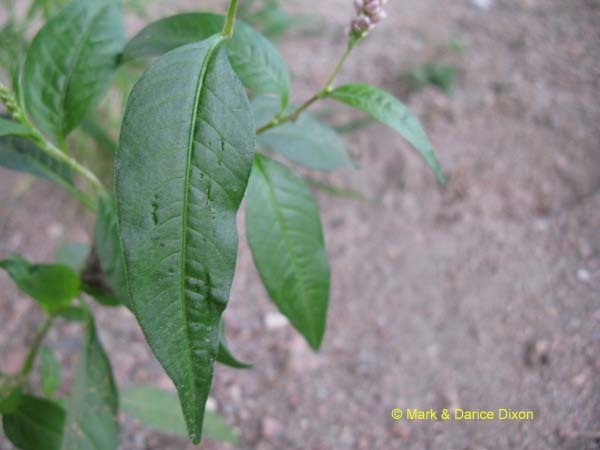 Of the 80 some odd species in the Persicaria genus, this one is spread throughout almost the entire United States and Canada. They are anuual herbs. 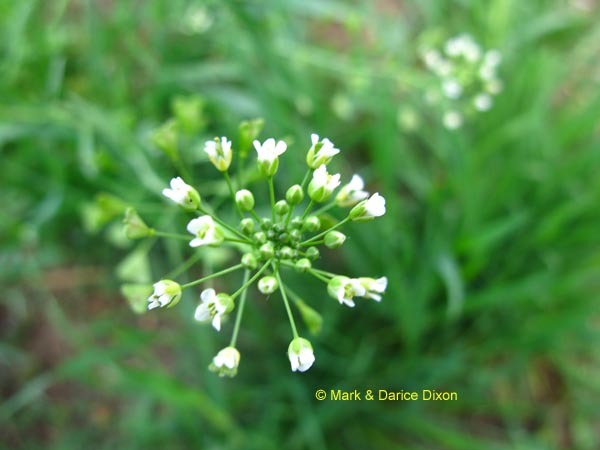 Most members of the genus are aggressive and/or invasive weeds, though some have been used as cover crops in the field and ornamental plants in the garden. Some can be mistaken from a distance for clover. USES: The website Plants for a Future has this: Leaves and stems - raw or cooked. They can also be made into an acid peppery condiment. They are very hot. The leaves contain about 7.5% protein, 1.9% fat, 8% carbohydrate, 2% ash. The leaves are said to contain rutin. Seed - raw or cooked. It is rather small and fiddly to utilize. The seed is used as a condiment - a pepper substitute. The sprouted seeds or young seedlings can be used as a garnish or added to salads, they are commonly sold in Japanese markets. They are very hot. 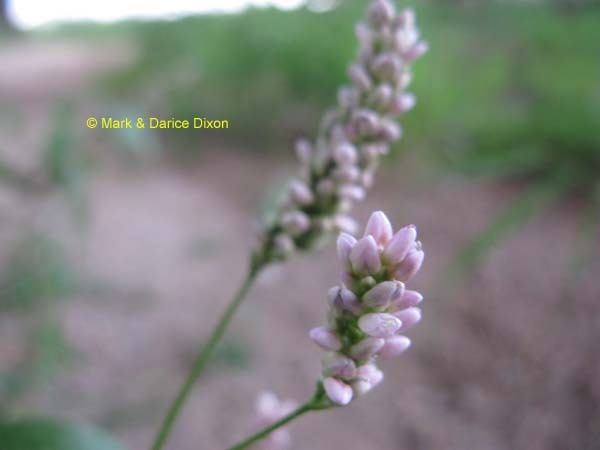 Smartweed has a long history of herbal use, both in Eastern and Western herbalism. It is not used very often, and is seen more as a domestic remedy being valued especially for its astringent properties which makes it useful in treating bleeding, skin problems, diarrhoea etc. The leaves are anti-inflammatory, astringent, carminative, diaphoretic, diuretic, emmenagogue, stimulant, stomachic, styptic. They contain rutin, which helps strengthen fragile capillaries and thus helps prevent bleeding. Use with caution. The seed is carminative, diuretic and stimulant. 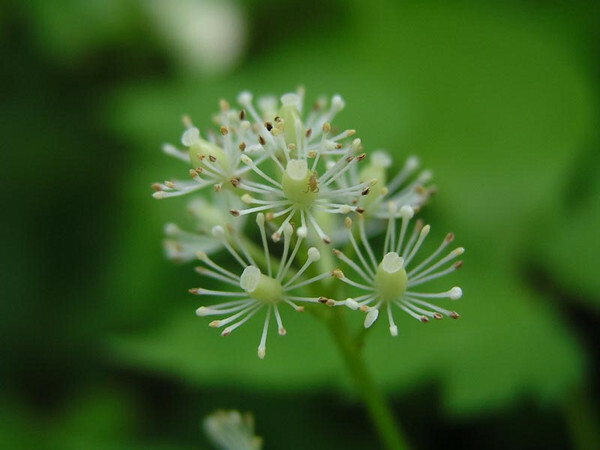 The whole plant, either on its own or mixed with other herbs, is decocted and used in the treatment of a wide range of ailments including diarrhoea, dyspepsia, itching skin, excessive menstrual bleeding and haemorrhoids. 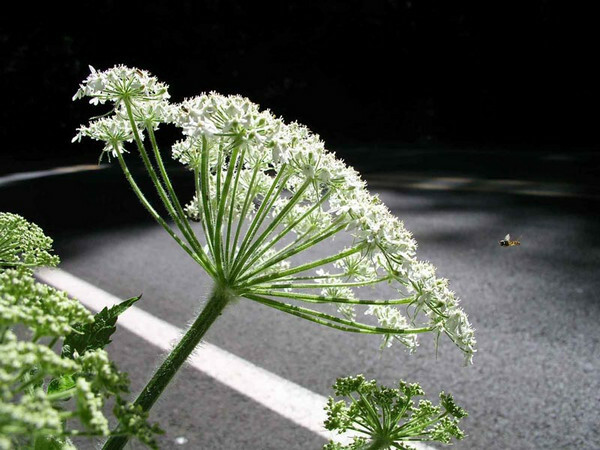 A poultice of the plant is used in treating swollen and inflamed areas. In Chinese tests, the plant was ranked 20th in a survey of 250 potential antifertility drugs. 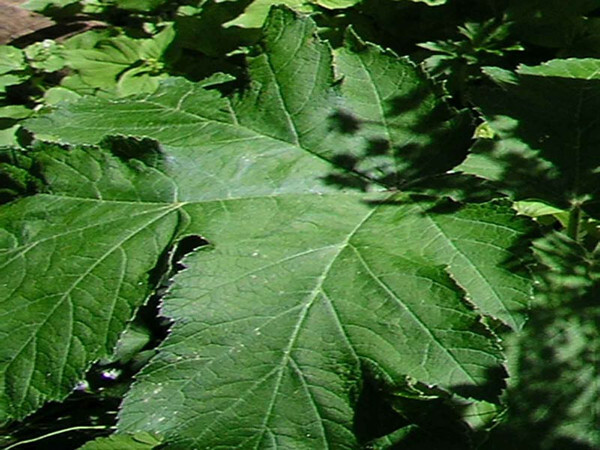 A homeopathic remedy is made from the leaves. It is used in the treatment of piles, menstrual pains and other menstrual complaints. Plant location: September 9, 2008 was the date the specimen was photographed in the Adams County Regional Open Sapce in Colorado state. The sandy looking soil in the photograph is actually a riverbed that has dried for a time. Bloom season: June to October. 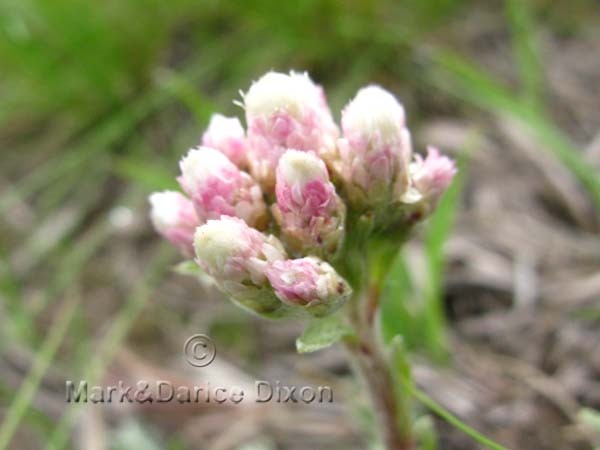 There are only about 45 species in this genus, most of them native to North America. The name comes from the characteristic of the plant's stamens to 'project' from the flower base and appear like insect antenna. We will take the scientists word for that, we don't see it in these specimens. 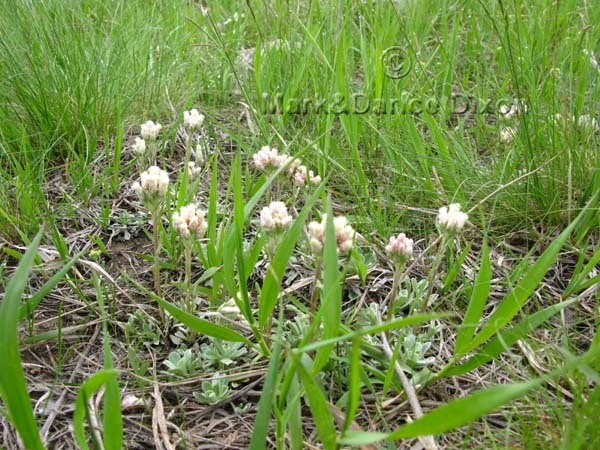 Plant location: Cle Elum Washington, early June 2007, and in the current frames are photos from the newer sighting - Boulder County Open Space, Colorado on May 19, 2009. Bloom season: July to September. This pretty little plants is all alone within it's genus. It may be plain looking but it packs a large suitcase of Native American uses. See below. 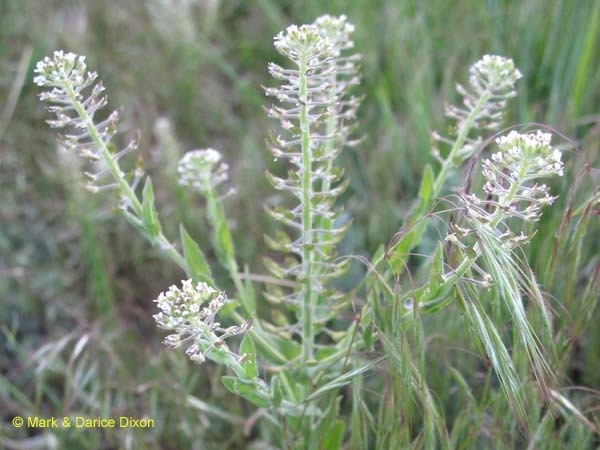 Per WIKIPEDIA is this: Capsella bursa-pastoris, known by its common name shepherd's-purse because of its triangular, purse-like pods, is a small (up to 0.5m) annual and ruderal species, and a member of the Brassicaceae or mustard family. It is native to eastern Europe and Asia minor but is naturalized and considered a common weed in many parts of the world, especially in colder climates. 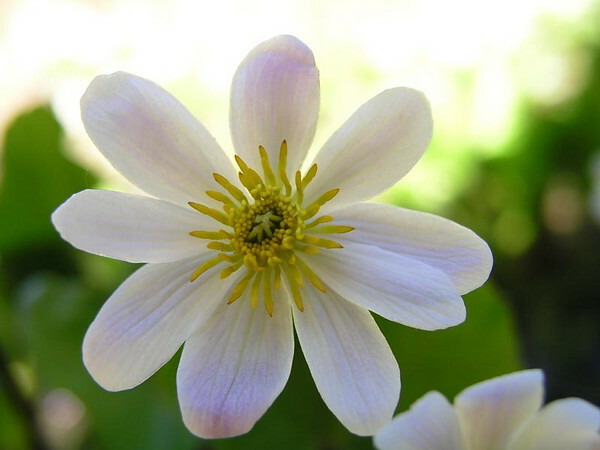 Unlike most flowering plants, it flowers almost all year round. Like many other annual ruderals exploiting disturbed ground, C. bursa-pastoris reproduces entirely from seed, has a long soil seed bank, and short generation time and is capable of producing several generations each year. USES: The website Native American Ethnobotany has these recorded uses by indian tribes: Cheyenne Drug (Analgesic) Infusion of powdered leaves and stems taken or small quantities of powder eaten for head pains. 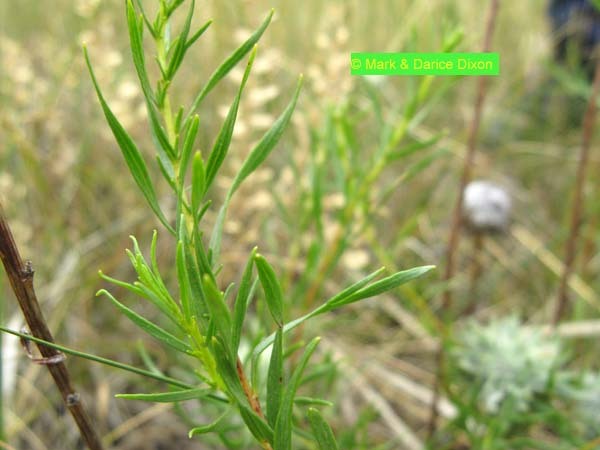 Chippewa, Costanoan, Mahuna Drug (Analgesic) Decoction of entire plant taken for dysentery cramps. Menominee Drug (Dermatological Aid) Infusion of whole plant used as a wash for poison ivy. Mohegan Drug (Gastrointestinal Aid) Infusion of seed pods taken for stomach, the pungency killed internal worms. Infusion of seed pods taken for stomach pains. Apache, Chiricahua & Mescalero (Bread & Cake) Seeds winnowed, dried, stored, ground into flour and used to make bread. Seeds roasted without grinding and combined with other foods. Tops cooked alone or with meat and used as greens. Thompson (Vegetable) Leaves soaked in water overnight and eaten raw or cooked as a green vegetable. Herbally, it is primarily used to stop vaginal bleeding, an action which may be attributable to the common parasitic fungus found with it, which is related to the vasoconstrictor ergot. 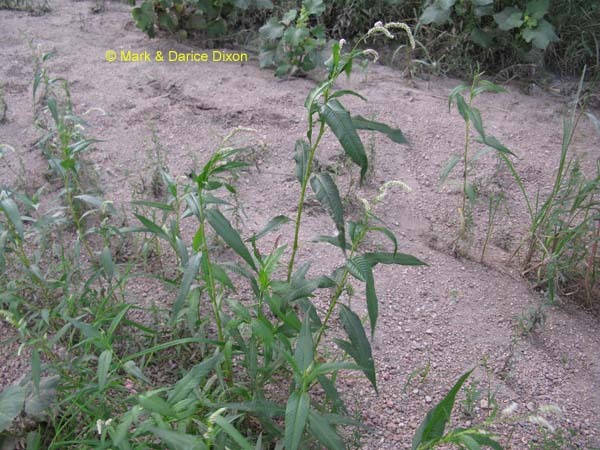 Plant location: Northglenn Colorado in a field. May 8, 2009. This delicate plant can easily be missed, the plant view was hard to capture and indeed we almost stepped on it! The plants completely blanket the United States and Canada. 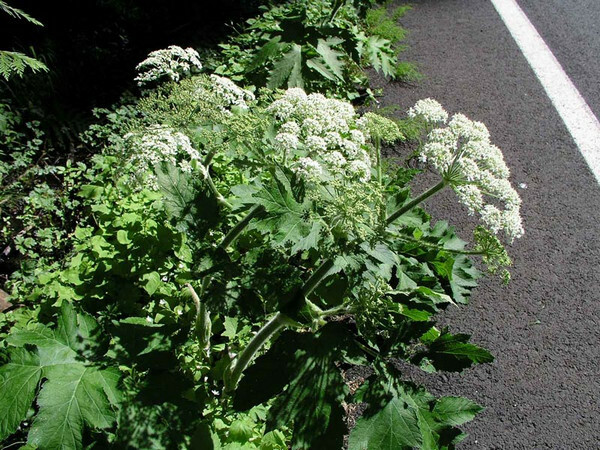 They are classed as invasive weeds by some sources. Bloom season: March to December. Some sources name this species Ipompsis candida but candida is actually a subspecies of aggregata, common name Scarlet Gilia. 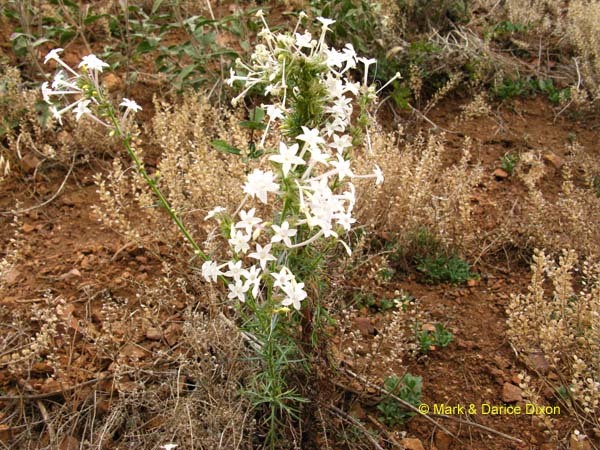 USES:This species has one record of Native American use from the website Native American Ethnobotany but the specifics are unknown: Keres, Western Other (Unspecified) Taxon known and named but no use was specified. The following are the other subspecies of aggregata: ssp. aggregata, ssp. attenuata, ssp. bridgesii, ssp. collina, ssp. formosissima, ssp. weberi. See WildflowersWest photographs of Scarlet Gilia here. Bask in the beautiful color variations of the plants here. Plant location: Hwy 72 & Plainview Road, Colorado, towards the front range - July 11, 2008. The USDA plant database shows these only in Colorado and New Mexico. Bloom season: June to August. The immediate thing that caught our eye about this plant was the presence of white and blue flowers appearing to be on the same plant. William Weber speaks of this as introgressive hybridization. Lovely and not especially common plants. They are native to the United States. Plant location: Rocky Mountain National Park on July 17, 2008. They are found only in the following United States: CO , NM , SD , UT , WY. Bloom season: Unknown.